A recently born bison calf, the first born at the Tallgrass Prairie National Preserve since at least the mid-1800s when the property was fenced for cattle ranching, grazes with the rest of the bison herd. Newly born bison are lighter in color but as they grow older, their color changes to dark brown. The calf was born on Mother's Day, May 9, 2010. In October 2009, the Tallgrass Prairie National Preserve brought 13 genetically pure bison from Wind Cave National Park in South Dakota. The preserve plans to add more bison from Wind Cave with a final herd size between 75 and 100 bison. Tallgrass Prairie National Preserve is the only unit of the National Park Service dedicated to the preservation of the tallgrass prairie ecosystem. 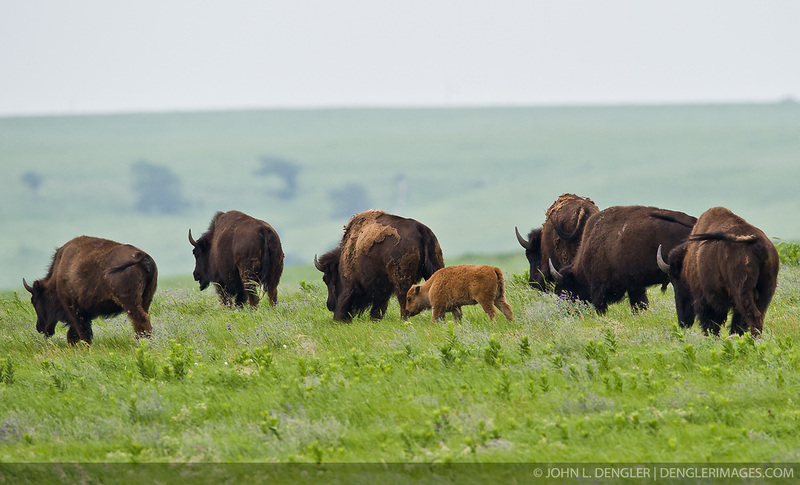 The Tallgrass Prairie National Preserve is co-managed with The Nature Conservancy. The 10,894-acre preserve is located in the Flint Hills of Kansas in Chase County near the towns of Strong City and Cottonwood Falls.